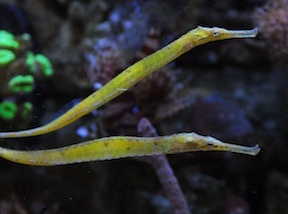 Syngnathoides biaculeatus is one of the larger pipefish found in the trade. They can handle reef environments as long as the temperature maxes out at 75 degrees Fahrenheit. However, they are more suited for a macro algae-based system. In my experience, they are one of the easier pipefish to get eating prepared foods assuming you acquire a healthy specimen and provide the proper environment. They tend not to eat in systems too small for them. Offering them live mysis shrimp for a few days and then introducing frozen mysis is what I have found to work best. They are slow eaters so it is best to house them with similar species.